Last night on Nightline, there was an extremely disturbing story about commercial dairy farms and the milk industry. The video is posted for you below. If you drink milk, you need to watch this. But, as you are watching this video, keep in mind that you do have options. This story fails to mention the side where the grass is greener- literally. You don't have to give up drinking milk all together. I'm not even advocating drinking "organic whole milk"- there are skeleton's in that closet as well that I encourage you to look into. There is a wonderful site filled with information about drinking raw milk and buying milk from local dairies. In the state of Texas, to my knowledge, there are 3 "Grade A Raw for Retail" dairies and probably more are popping up all over the state. People immediately become fearful at the thought of drinking raw milk and its safety. But, what the government deems as "safe" is shown in the video. At the dairy we buy from, you see cows in pasture eating green grass in the fresh air. The milking room is clean and not filled with poop. Our family switched over to raw milk 3 years ago. We absolutely love it! Raw milk definitely costs a little more than "organic whole milk"- you are looking at anywhere from $5 to $10 a gallon. But, in my opinion, if you were to make a few changes in your diet towards a healthier lifestyle, dairy would be one of the first areas I'd start closely followed by meat. I haven't really blogged about this yet. I wanted to make sure that it was going to for real stick- that "IT" being homeschooling. We heard very clearly from the Lord in October that were to homeschool. Kaylyn started Kindergarten this year at a WONDERFUL local Christian school. There were no "issues" with the school in the least. In my mind, it was near perfect. We just felt a very strong impression from the Holy Spirit. Jason has felt strongly about the Lord leading us to homeschool for a while prior to October. But, he was so patient with me and wanted the Lord to change my heart about all of it since the majority of the homeschooling responsibilities would fall on my plate. This gal didn't go down without a fight though. I'm not proud that I fought the Lord about this. But, I don't want to give the impression that it was the easy for me. I fought, I questioned, I bawled, I feared, and at the end of it all I said "let's do it". I don't have any fancy words to describe the homeschooling experience thus far other than "it fits". Our lifestyle out on a farm is very conducive to homeschooling since a living and breathing schoolroom awaits us (I don't think you have to have a farm to homeschool though). I think what I've learned the most through this process is that there isn't an exact formula to homeschooling. 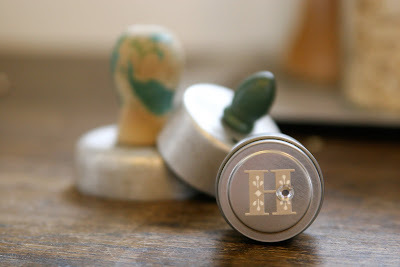 That is sort of the beauty of it, but also hard for a brain like mine who likes to stick labels on things. If you asked 10 homeschool moms how they "do school", you would get probably 12 different answers. Those numbers don't even go together. But, what I found is that some moms have schedules they follow to a "T". Other moms throw schedules out the window. And some moms have different schedules depending upon what day it is and what the weather is like. For me, the balance is somewhere in the middle knowing that have small babies at home but we also need structure and routines. 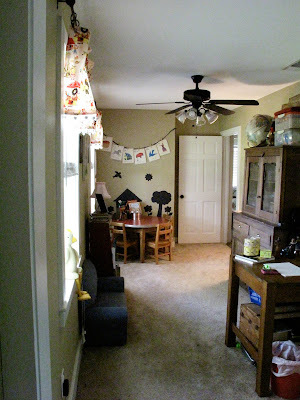 I love to embrace the flexibility of homeschooling, but I personally know that I do need structure in my life or chaos takes a toll on me and our home. I most definitely don't have everything figured out. And that is okay. All of this is to say, there isn't a "method" to homeschooling- just lots and lots of prayer involved. If the Lord has called you to homeschool, He will equip you. One of the things I beat myself up about the most is the fact that I don't have a college degree. I didn't even make it half way through college. But, something was off in my brain to think that because I don't have a teaching certification I'm not qualified to teach my children. That is a bogus thought. If you are a mother, you ARE a teacher regardless if you homeschool or not. Finding the right curriculum can be overwhelming in and of itself. 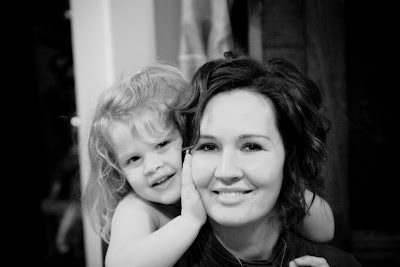 I asked several wise women who homeschool in my life and narrowed it down to a few to really dig deep into. It helped me to write down goals I wanted my girls to walk away from their schooling experience. Wow, this post is a lot longer than what I intended it to be. So far, I've LOVED homeschooling. There are challenges most definitely (i.e. time management on my part). 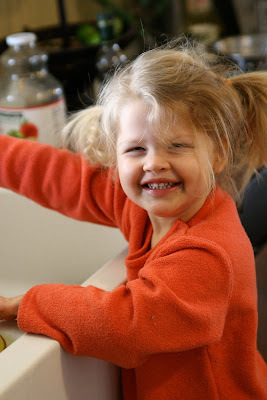 Kaylyn has really loved homeschooling too so that makes me happy that she looks forward to it everyday. 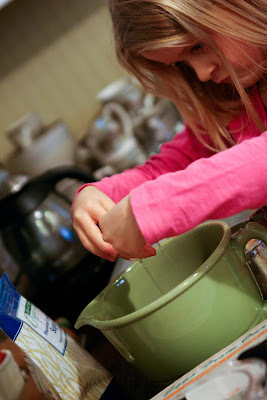 We try to incorporate things she loves to do in to our learning- cooking, sewing, crafting, whatever. I've seen her grow so much and I've seen our relationship grow so much. 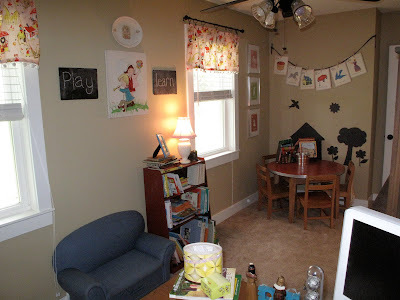 I made our little office/computer room into more of our schoolroom. I don't think that you need a schoolroom to homeschool. I've seen families do just fine without one. We had the space already. This little area has became my favorite spot in the house. These photos were taken after I had everything all cleaned up. If you were to come over to my house on any given normal day, you would find pipe cleaners everywhere, beads on the table, legos on the floor, and books piled a mile high next to the couch. One thing I do KNOW for sure.....we are NOT a pinto bean playin' kind of family. Those are for eatin' in this house. I decided to take a rubbermaid storage container and fill it with beans and funnels and cups and lots of other fun things. I even put a sheet under the box for the girls to play on. Somebody just slap me upside the head. What was I thinking??? I'm still finding beans all over the house. 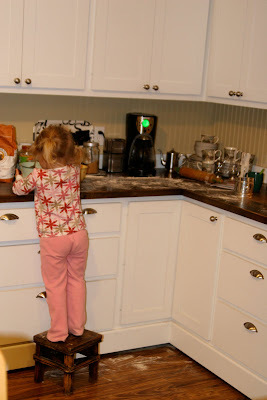 Messes are fun- if they are easy to clean up. The bean box has officially been retired. 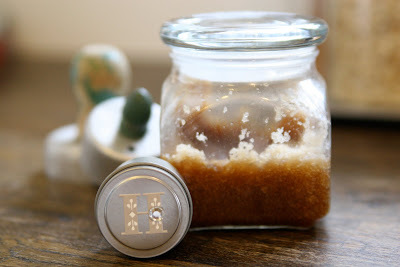 For some Christmas gifts the last few years, I've made homemade lip balm and sugar scrub to give to various people. The lip balm I've found to be somewhat addicting and extremely moisturizing. Bottom line....it works. A lot of lip balms and lipsticks out there sold in stores contain petroleum. I've adopted a good rule of thumb over the years in regards to what I put on my body as well. If you can't drink it or eat it (as in, not die from it....who would enjoy eating lip balm?? ), it's probably not safe. A good resource to look up the toxicity level in the products that you use on your body is the Skin Deep: Cosmetic Safety Database. You can look up virtually any product that is out there for hair, face, body, and baby. You will be amazed at the things you learn about common products you use every single day. Did you know that your body absorbs 60% of what you put on your skin? That is a crazy number. If you put a clove of garlic between your toes, you would taste the garlic in your mouth in just a few short minutes. The recipe I used for the lip balm was surprisingly found on Martha Stewart's website. I liked all of the ingredients that were used so I decided to give it a go. Melt the beeswax and carrier oil in the top of a double boiler. This is basically a metal bowl sitting on top of a saucepan with water boiling in the saucepan underneath the bowl. Stir really good so that the two combine. Remove from heat and add the remaining ingredients. 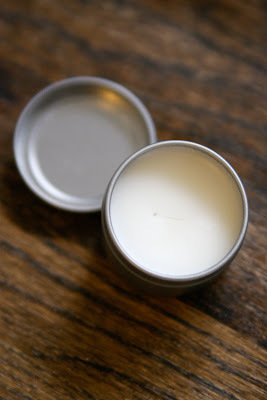 Pour the balm into your container to cool. It will solidify back again once its cooled. I also purchased my containers from Majestic Mountain Sage. For a good article that explains carrier oils and their shelf life along with storage, CLICK HERE. The sugar scrub is also wonderful! Cane sugar naturally contains glycolic acid which is a natural alphy hyrdroxy acid that exfoliates the skin. Farmer Jason uses this stuff on his hands and it cleans all the dirt out the nooks and crannies leaving his skin smoother....not smooth, just smoother because he has really rough hands. I love em' though. I adapted my recipe from this one and added a few things I knew that were good to moisturize and heal the skin. Mix everything together in a bowl, and put in a jar. How simple is that???? Really! Ruthie is almost 8 months! I held off as long as I possibly could, but Ruthie is officially eating solids. She has been eating them consistently for about 3 weeks now. She is enjoying real food quite well and momma is not enjoying the diapers. I had to call (on the phone) for backup for the first real food poop diaper I changed. I was so ill-prepared and did not know what to do with it. The poo was smeared into the diaper so flipping the turd into the toilet was not an option. Jason suggested I go out and get a water hose after it, but really, how practical is that every single poo diaper. And besides, it's really cold outside too. Oh the joys of cloth diapers and motherhood. Poo is definitely a frequent topic of discussion. No worries, I think I've got it figured out now, but I'm ALWAYS open for suggestions from cloth diaper mommas out there. Just don't tell me to soak them in toilet water. I ain't doin' dat! carrots, potatoes, avocado, yogurt, meats, raw cheese, beans, peas, apples, pears, bananas, and I'm sure other things I'm missing. All of these foods I'm either mashing up with a fork or pureeing them in a blender. I try to give her the foods as fresh as possible, but I've also frozen big batches in ice cube trays too. I wait until they've frozen all of the way through in the trays and then pop out the cubes into a big storage bag and put it back into the feezer. Her little personality is really starting to come out. She is definitely laid back in every single way. 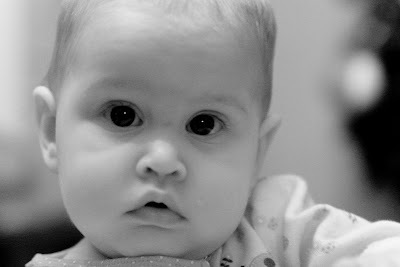 Funny thing happened....right before Christmas (about 7 mo) she was sitting up on her own unassisted. I know this is late, but I'm okay with that- she is my baby and sitting up leads to crawling, which leads to walking, which leads to driving, which leads to leaving and cleaving: hopefully on the farm of course. Well, about a week later I went to take a photo of her sitting up and she wouldn't sit up. I guess she decided it was overrated or something. Since then, she will sit up, but she'd prefer not to. Ruthie is just so darn sweet and is a total momma's girl. When I walk into a room, she knows it. And when I leave, those still in the room with her know it. 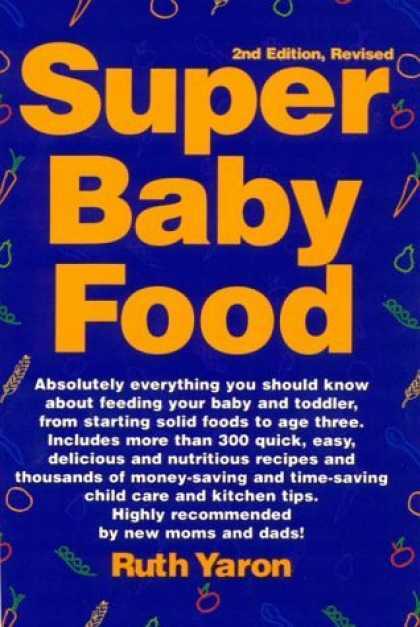 I found such an awesome resource for starting solids- "Super Baby Food" by Ruth Yaron. This book is filled with a wealth of information, practical tips, and wonderful recipes. I've thoroughly enjoyed flipping through it. I highly recommend it. 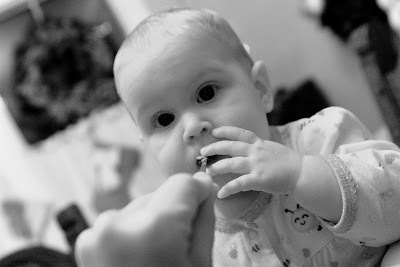 Here is a few photo of her first bite of food. And here is one just because:). to this in just one short year. to dishes in just one short year. 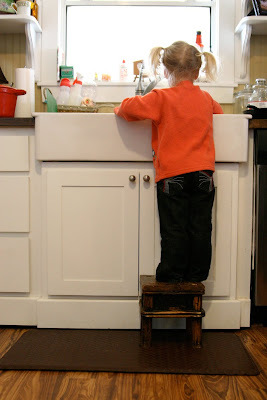 It's simply not cool to this momma......well, the dishes part is. Look at that blue jean booty. Cute, cute, cute! 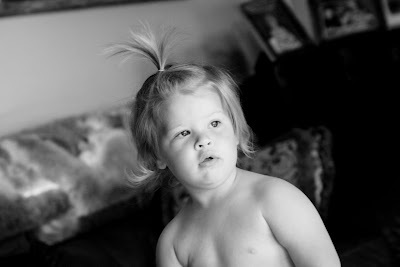 These photos were taken of Laney Rae exactly a year apart. 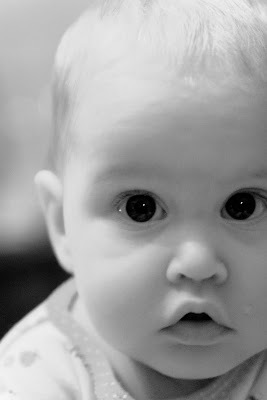 I was going through photos organizing all 25,000 of them and was amazed at how much my "Rae Rae" has changed in one year. This also served as a good reminder to me. I took the photos exactly a year ago fully intending on posting them to document this sweet ones journey. But, never got around to it. The next thing I know, she is washing dishes and wearing blue jeans. I want to be better about documenting our little family's journey. 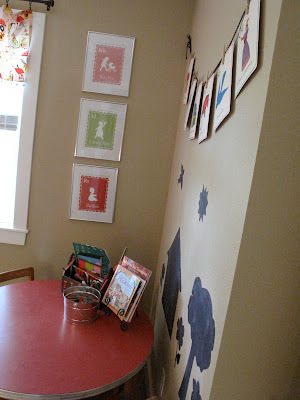 Oh, and I'm looking into ways to printing my blog instead of scrapbooking. Has anyone printed their blogger blog yet??? Did you like how it turned out? Laney Rae had to take a picture with momma. She "posed" me and everything. So cute! My girls love to cook and they love being in the kitchen with me. I have to be honest. This use to drive me crazy!!! Selfishly I knew it was more work for me too. You know…. 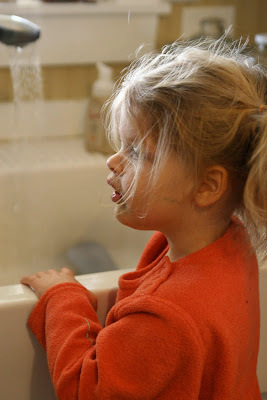 the all to familiar battle most mommies go through- doing it yourself vs. teachable moments. Tasks are much easier (and quicker and cleaner and….) if you do them yourself. 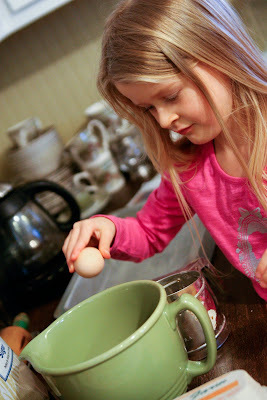 However, I have grown to LOVE having my girls in the kitchen cooking with me. We have a total blast. I can see them growing in the area of cooking and that makes me smile. 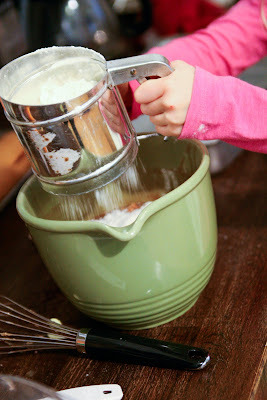 My hope is to raise little girls who love to cook and appreciate good wholesome REAL food. I bought KK this cookbook for Christmas. I LOVE LOVE LOVE LOVE it! 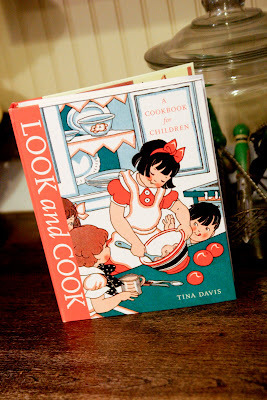 The artwork is spectacular, the recipes are fun and simple, and it creates a sense of good ole’ home cooking nostalgia when you open it up that makes you want to grab an apron and whisk and whip something up. There is a whole series of the books for girls and I highly recommend them. We also have the "See and Sew" book by Tina Davis and it's a gem as well! Here are some photos over the last week of us hanging out and cooking together.....from scratch. Kaylyn cutting her ham and pineapple. 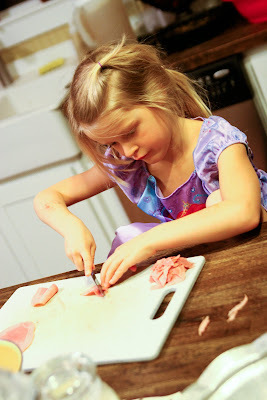 She is already so careful and great with knife. I let her do a lot of my food prepping. 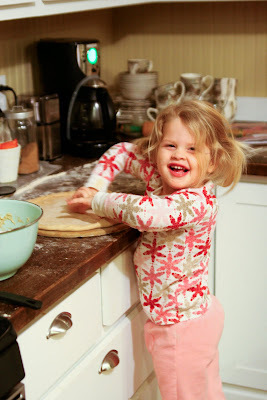 My little dough girl, Rae Rae, spreading the homemade pizza dough. A good reminder for me.....this is suppose to be "FUN"! 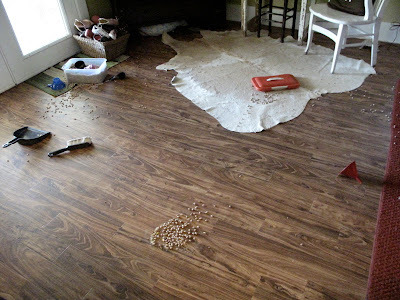 Put a smile on your face momma and make a mess! 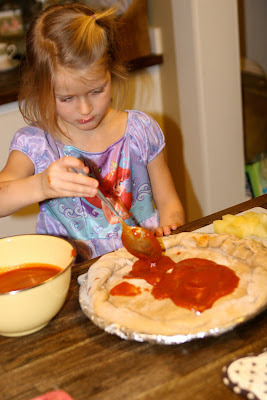 Kaylyn, spreading her sauce and building her pizza....the sauce was NOT from scratch. 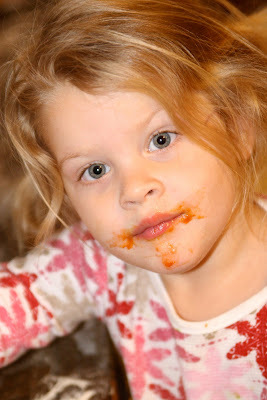 I cold busted Rae Rae eating the sauce instead of spreading. But, who could get mad at a face like that.....momma, laugh, I say. Laugh! Because, there will be messes. Lots and lots of messes. 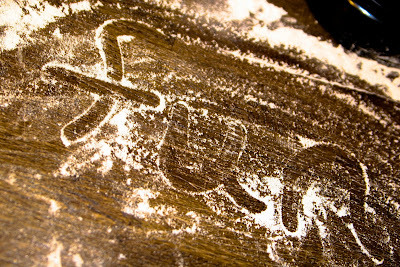 Flour flying, sauces slinging, cheese crumbling....it's only part of it. And there will be dishes. 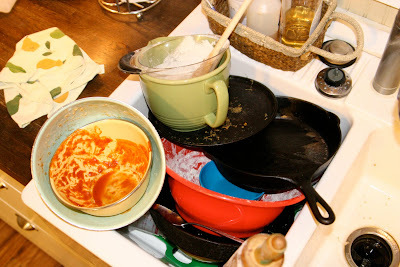 Lots and lots of dishes. A sink full of dishes to be exact. But, its okay. 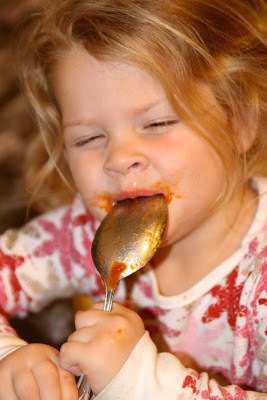 We had fun....and not only can my girls learn to cook, they can learn to do dishes too:). My momma always taught me,"A good cook always cleans up her mess." The reward is far worth it and the flavors are unlike any other. 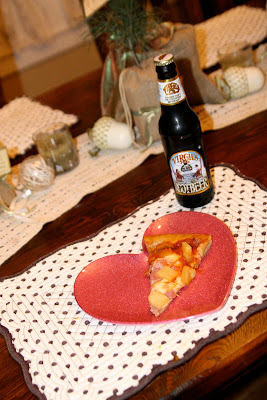 Especially paired with a Virgil's Natural Micro-Brewed Root Beer. Heavenly. A real treat! 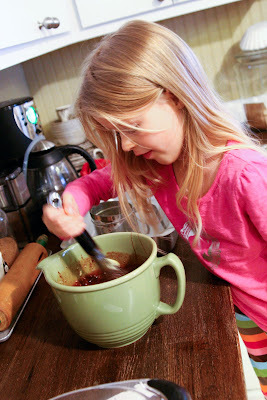 On a separate occasion last week, Kaylyn decided she wanted to make a chocolate cake from scratch. 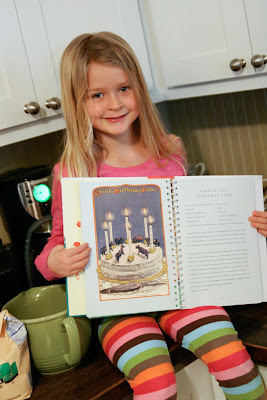 So we got out her cookbook and I let her pick her recipe out. I was SOOOO proud of her. She made her chocolate cake all by herself without my help- not once. Cracking the egg. She is pretty much a pro at this. I'm amazed that she can manage to crack 12 eggs and not get shell in the mix once (unlike her momma who is reckless abandon). Sifting her flower for the cake. Oh and I would like to show you what the cake looked like, but it was gone far too quickly to capture it in all its beauty. On the real......her chocolate cake was the BEST chocolate cake I've ever tasted. Ever. I think there was only a handful of ingredients too all of which were wonderful clean ingredients. I could go on and on about the imagery that pops into my mind over this photo. Apparently these are actual shoes for sale somewhere in the world. 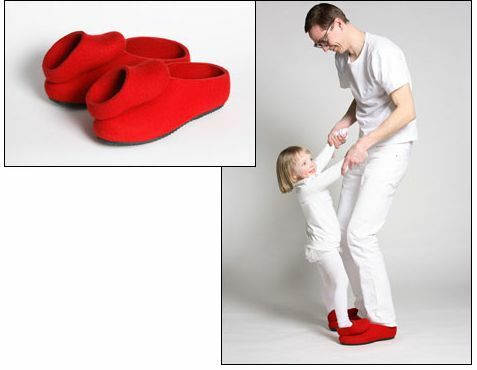 They are called “Dance Shoes”. How fitting. This is such a beautiful picture that I can totally wrap my brain around. It will make more sense as this post progresses. Bare with me here. I’m a visual learner. This post is hard for me. I’ve sat down to write it several times only to find myself speechless. How can I put into words all that has happened in my life and heart in one year? I cannot. There is just too much. This already monstrous-size post that probably only my mom will read (love you mom) would be even longer. How can I explain the anticipation and excitement that a new year holds without getting overwhelmed by a list of resolutions? I’m very excited! There is just something refreshing about the start of a new year. But, how quickly I forget that is EXACTLY how the Lord is daily (Lamentations 3:22-23). His mercies (some versions say “compassions”…I love that) are new every morning. His faithfulness is on display every single day. I almost didn’t write anything acknowledging the fact that it’s another year. I just don’t know where to begin. How can it even be 2010? Saying “0-9” had such a nice ring to it. But, “10” or “2010” or whatever we are to call it….not so much. For the sake of documenting my family’s little journey, here goes a very poor attempt to verbalize my thoughts at this point on the journey. I don’t feel like I “owe it to my fans” to post something. The Lord knows that using the words “fans” and “my blog” simply don’t exist together. This isn’t an attempt to fish for compliments either- just a fact. I’m not a big fan of resolutions- they are fine if you dig that sort of thing. Well, maybe I’m not a fan of resolution lists- again, just a personal preference of mine. I tend to find myself overwhelmed looking at all of the things that I WANT TO ACCOMPLISH OR LEARN. I feel weighed down by all of the tasks and skills that have yet to come to fruition and the road that I know it will take to get there. And I know that the Lord’s desire for me is not to live in an overwhelmed state of mind focusing all of my efforts on myself. He wants me to abide in Him and keep in step with Him. My favorite scripture that has played throughout my mind often this year is found in Galations. For me, it’s a victory cry and reminder not to get boggled down and overwhelmed. Anytime we focus on those things entangling us, we find ourselves focused on self and not “in step” with Him. A lot of things that I may want to pursue might not be in line with His will for my life. And if we are being totally honest here, I feel like if we are right in our relationship with Christ and keeping in step with Him, some of those things on our list will happen (spending time with Him more, honoring our bodies, eating better, spending more time pouring into the lives of our families, etc)- as long as they are within His will for our lives. I realize saying all of this is much easier than actually doing it. Boy do I know this story all too well!!! I find myself smack dab in the grip of this struggle between keeping in step with the Spirit or off doing my own thing. I’m definitely not saying that I have this figured out and know how to do it perfectly. My prayer over these last few days has been for Him to leave no stone uncovered until ALL aspects of my life are laid bare before Him and EVERYTHING in my life is His. EVERYTHING! I know there are still lots of things I’m holding onto and not giving over to Jesus. My nature at this point in the year is to look back at my failures. It would be very easy for me to look back on the year and beat myself up over the things that I said I wanted to change at the beginning of 2009, but have yet to see growth in. Or all of the things I thought I would be doing by now, that have yet to be learned. I use to live my life in constant regret from the moment my feet hit the floor. This is a very depressing state of mind to be in always looking back and never looking forward. I’m a city girl trying to learn how to be a farmgirl. Of course that so-called list would be miles long! I’m learning so much. I said I wasn’t a big fan of resolution lists, but I am a fan of growth and pressing forward taking the next step. I can honestly look back at 2009, and see the hand of God growing me and molding me throughout the year. I’ve had victories in some areas and light shed on some very dark areas that still have yet to gain victory. For now, I choose to rejoice in the victories and pray for the victories to come knowing that I have so far to go on this side of heaven in my relationship with Him in the way I do life. This year, I resolve to be PURPOSEFUL. One word that I hope permeates my life.